Whispers in the Loggia: "He Waits. Always." 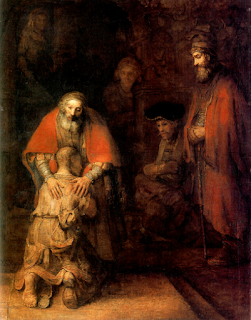 We need to think — with our heart and our mind — of the parable of the Prodigal Son. The younger of two brothers, who squandered his part of his inheritance by living a dissolute life, was forced to be a swineherd in order to survive. When he realized his mistake, he returned to his father’s home to ask if he could, at the very least, live among the servants. His father was waiting for him, he had been staring out at the horizon waiting for his son’s return, and he approached his son even before the man could say anything; before he even confessed his sins, the man’s father hugged him. This is the love of God. This is his overabundant mercy. 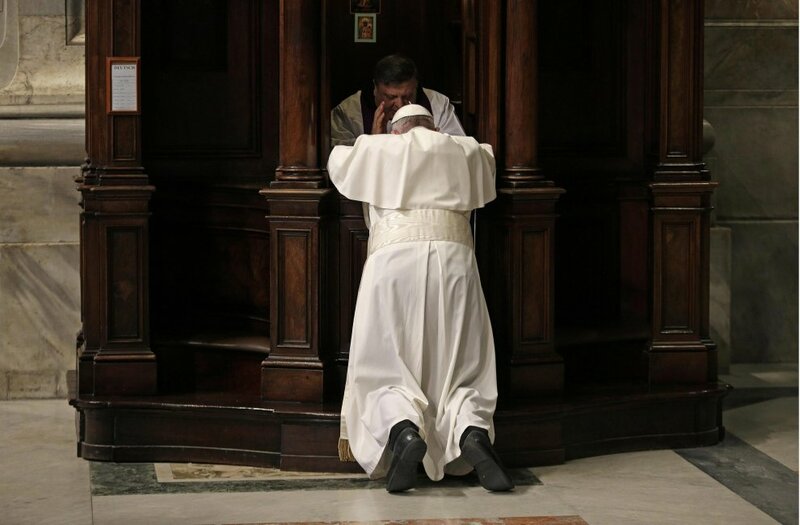 As this weekend brings the twin centerpiece moments of this Extraordinary Holy Year of Mercy in the global observance of 24 Hours for the Lord – the round-the-clock availability for Confession requested in every diocese – and the reason for its timing with the Prodigal Son as the Sunday Gospel, the preceding is a piece of the Pope from Francis' Q&A treatise for the Jubilee, The Name of God Is Mercy, which was released in January. Before celebrating his annual Lenten Penance Service last night in St Peter's – during which, yet again, he made his own stop "in the box" before leading others in the sacrament for an hour and a half – in a speech to the annual course for confessors organized by the Apostolic Penitentiary, the Pope issued yet another strong plug for the venue of his own conversion, urging the church to "restore to the center – and not only in this Jubilee Year – the Sacrament of Reconciliation," saying that "every absolution is, in a certain sense, a jubilee of the heart, that brings joy not only to the faithful and the church, but above all to God Himself." Today more than ever, we Pastors are especially called to hear the cry, perhaps hidden, of all those who wish to encounter the Lord. We need to re-examine those behaviours of ours which at times do not help others to draw close to Jesus; the schedules and programmes which do not meet the real needs of those who may approach the confessional; human regulations, if they are more important than the desire for forgiveness; our own inflexibility which may keep others away from God’s tenderness. We must certainly not water down the demands of the Gospel, but we cannot risk frustrating the desire of the sinner to be reconciled with the Father. For what the Father awaits more than anything is for his sons and daughters to return home (cf. Lk 15:20-32). May our words be those of the disciples who, echoing Jesus, said to Bartimaeus: “Take heart; rise, he is calling you” (Mk 10:49). We have been sent to inspire courage, to support and to lead others to Jesus. Our ministry is one of accompaniment, so that the encounter with the Lord may be personal and intimate, and the heart may open itself to the Saviour in honesty and without fear. May we not forget: it is God alone who is at work in every person. In the Gospel it is he who stops and speaks to the blind man; it is he who orders the man to be brought to him, and who listens to him and heals him. We have been chosen to awaken the desire for conversion, to be instruments that facilitate this encounter, to stretch out our hand and to absolve, thus making his mercy visible and effective. Granted, at least a few won't find this as tantalizing as Francis' definitive word on the Synod – which, as mounting speculation would have it, might see its release two weeks from today. That said, most of us have enough to occupy ourselves with in the meantime: especially at Lent's halfway point, and even more this weekend, the most important reconciliation we each have to worry about isn't somebody else's, but our own. At The Border, El Día de "Los Ultimos"
"It Is With Joy That We Have Met Like Brothers"